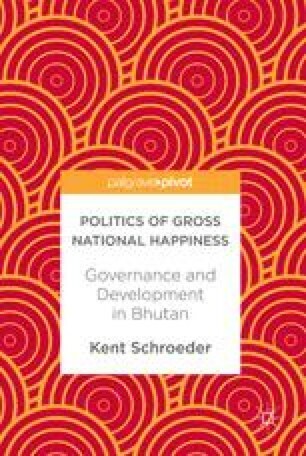 This chapter analyses the role of the Gross National Happiness (GNH) governance framework in shaping power dynamics in the implementation of Bhutan’s tourism policy. It argues that the political dynamics of the policy implementation process are a mix of conflict, cooperation, and isolation among state, private sector, civil society, and donor actors. No single actor dominates the process. Moreover, these actors rarely use the GNH-specific policy tools and do not share a common understanding of GNH itself. A common commitment to the Buddhist-inspired cultural values that underlie GNH nonetheless shapes the actions of governance actors in a manner consistent with GNH. The result is policy outcomes that generally reflect original GNH policy intentions. Association of Bhutanese Tour Operators. (n.d.). Tourism reference kit. Association of Bhutanese Tour Operators. http://www.abto.org.bt. Accessed 12 Feb 2017. Dema, K. (2015, December 10). Guides against tariff liberalization. Kuensel. http://www.kuenselonline.com. Accessed 10 Apr 2017. National Council of Bhutan. (2016). Review report on tourism policy and strategies. National Council of Bhutan. http://www.nationalcouncil.bt. Accessed 4 Apr 2017. Tshering, K. (2015, December 7). Tariff liberalization to benefit ancillary sectors. Business Bhutan. http://businessbhutan.bt. Accessed 10 Apr 2017.